﻿ Hotel Cesario, Cebu | FROM $26 - SAVE ON AGODA! "Good cheap hotel with nice buffet breakfast/nice swimming po..."
Have a question for Hotel Cesario? "Front desk staffs were ok & friendly, they were also accommodating & helpful." "Staff are really friendly and helpful." "The hotel is near the airport a plus factor for them is the free shuttle service." Sitting on Mactan Island off the strait to mainland Cebu, Hotel Cesario offers a budget alternative to its sister property, The Bellavista Hotel. Guests at this affordable property have access to the sauna and rooftop swimming pool at the Bellavista where they can also enjoy uninterrupted views overlooking the strait. Sit back and relax in the hotel’s sitting area decorated with local artwork or head outdoors and sunbathe in the warm weather. Each of the guestrooms comes with modern amenities while its attentive and friendly staff will go out of their way to ensure you a comfortable stay at Hotel Cesario. "Location is strategic, very near to the airport." Really enjoyed the breakfast buffet and the pool. Rooms were a bit old but I think they will do a big reservation soon so I think it will be closed. It was 1450p for a room which is pretty good when 2 people can fill up on a big breakfast. Enjoyed my stay. Availed of the free airport pickup. Location is strategic, very near to the airport. Front desk was kind enough to have our breakfast meals packed since we had an early flight the next day. Would definitely stay again. The hotel was nice even though its not luxurious but its okay. We never regret staying in this hotel. +Location near the airport +Courteous staff +Clean room +Super cold aircon +Our special request granted +Hot and cold shower +They clean our room everyday as per SOP +Breakfast buffet was superb +Partner BellaVista Hotel was nice too +Free airport pick-up/transfer -No wifi, however we have data Overall, we had a nice stay in this hotel for 3 days and 3 nights. Sobrang sulit na if you will stay here just to have a home to go to during your outside activities in Cebu. Very close to airport. Our flight was 6:15am. They packed our breakfast and got the free shuttle bus ready by 4:15am. Very good service. People are polite and always ready to help customers. Strongly recommend to people who make transfer or need to take early flight. The hotel itself is old but the room is clean, quiet and comfortable. We stayed here just for 1 night as a stopover. I wouldn't suggest going out and around the hotel as the area isn't the best. There is a mcdonalds down the road but that's about it. Room service is decent and so is the cafe upstairs. Rooms are a bit dated but for what you pay and for one night it's fine. great budget hotel with free airport transfers + great breakfast + very nice swimming pool on the roof with terrific views- good WiFi but only in lounge & dining room. Near shopping mall=only 15mins walk =one direction is gaisano & opposite is robinsons. Very good and staff were helpful. My kids had to leave the hotel before breakfast began and they offered them a packed breakfast. My third child was taking 0125 flight and was not staying at the hotel, but the staff offered to take him in the shuttle. That is what I call excellent service. As always the wifi never works in the only place listed eg Lobby area. So you must go next door to ajoining hotel to get wifi in pleasent surrounding. Pool close for repair I think some fat american had broken it through normal use. It's an old Hotel with basic amenities. 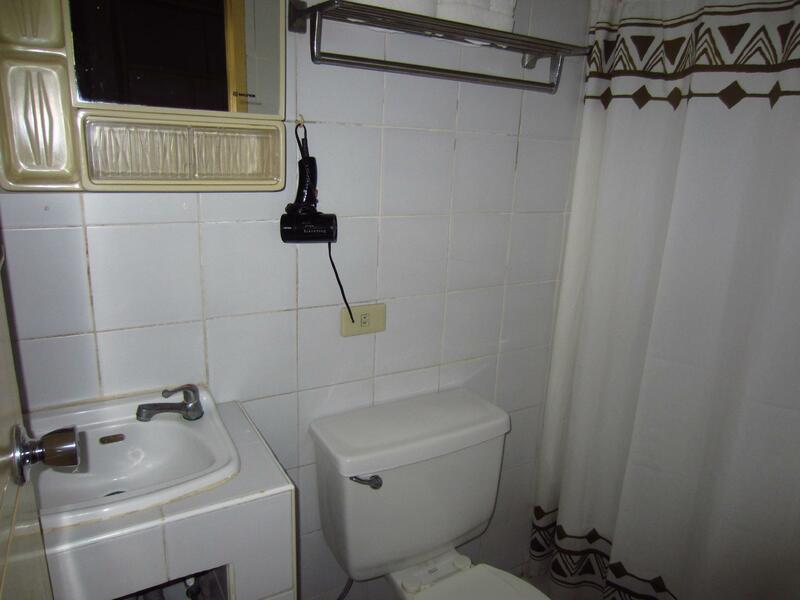 The rooms are generally quite and clean and air conditioned. They greet and transport you for free in a nice van when you arrive. They give you a nice buffet breakfast and use of the swimming pool at the next door Bellavista hotel. This hotel is close to the Mactan Airport. Well worth the money spent for your room. normally staying at syster Hotel bellavista we decided to stay at cheaper cesario since we had early flight at 5 in the morning. no Problem to get our breakfast box and Transportation to the Airport. in other cities the Transportation alone would be as expensive as tis overnight stay with everything included. if not staying at bellavista will stay again at cesario. Because of the neighborhood, this is more than a place to stay before and after flights. However, one of the things I liked best about Hotel Cesario were the places to put things, like suitcases, clothes and all the other things travellers have with them. It was easy to be organized. Also, the pool and buffet breakfast were great benefits. With what it has to offer, Hotel Cesario is set up for a longer stay than just an overnighter. 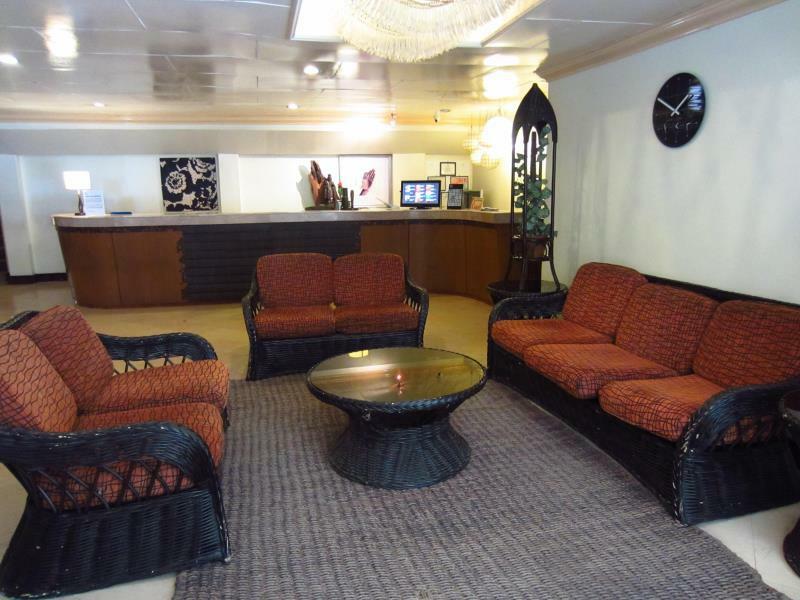 The hotel has basic room but it comes with a free shuttle service to and from mactan airport. Plus you get to use the bigger hotel's swimming pool! Breakfast is superb with many choices from American, to Filipino and eauropean food! my family enjoyed our short stay in this hotel. my mom even felt that she was treated with a luxury trip with this accommodation. the rom is basic, the sheets had needle on the left side but we didn't, mind it, since nobody got hurt. the receptionist was very helpful with all our inquiries. we travelled with a 9 year old kid who was treated to a free breakfast. my younger brother enjoyed the serenity of the place. 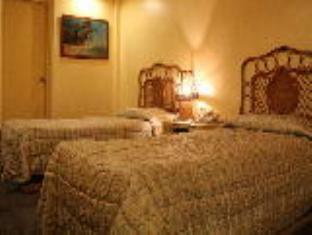 My wife and I always stay at Hotel Cesario whenever one or both of us fly into Cebu. The hotel is only ten minutes from the airport and they pick us up and take us back for free. They are very nice and friendly and service our needs. I just wished they had enough rooms for a couple coz I had to sleep separately from my bf, the single bed is only good for 1 person. The food in the hotel is great, the hotel staff are friendly and accommodating. convenient, clean and great service! it's a five star service for a very affordable price! i booked on the same day and the staff are very efficient and helpful. picked us up on time from the airport. the location of the hotel to the airport is very near and the rooms are clean and ready. breakfast is excellent! will definitely go back! really enjoyed my stay even for a very short trip. they provides free pick up from the airport even for arrival at midnight or dawn. the taxi would take about 80 peso. the breakfast included in the room fee served in the hotel bellivista next door is very good. the free wifi at the lobby of hotel bellivista is also very goog. if you need to keep your luggage after checking before going to the airport or other place, you may keep you big bags at the gaisano shopping centre free of charge. you may dine or shop there before leaving too. the supermarket at the basement sell many items including dried mango, etc as present back home. It's a short stay since i have to fly in a couple of hours. though it's a quick rest but i feel relax as it is quite, enough for the need of relaxation for the next trip. Transport back and forth is good as it is convenient. Staff are good and accommodation. staff were friendly. But when you go in the midnight, make sure you buy everything you need at the airport as there is nothing to eat around the hotel and inside the hotel. I met a cockroach in the bathroom. It was a surprisingly really good hotel! I personally found the beds very comfortable to sleep in, the aircon worked and was cold, the hot water was working, and so was the TV. The room was also very clean, no bed bugs, very nice to sleep in. The wifi - Although, they (Staff) said that the wifi is only available in the lobby, I was surprised I was able to access the wifi inside my room! And it worked very well - quite fast even! My room was located at the end of the hallway near the fire exit, 2nd floor (227 if I remember), and the wifi worked even inside that room! Look for Cupola Lounge, that's the wifi username at the time of stay. Breakfast - Wow, it was buffet! There were fruits (Pineapple, watermelon), pancakes, garlic rice, bacon and toasted bread, fish fingers, beef broccoli, eggs, cereals and all the water & coffee, tea you want. It was very good, and filling! Location - I personally chose this place because it was near the airport. And indeed, it really is! The hotel also offers airport transfers, and it was free of charge going to the airport. Staff - The staff were very pleasant, approachable, and overall, great service! Would not mind staying here again!